4-H is the largest national youth organization in the United States and in North Carolina it functions locally. Camden County 4-H has lots of ways to get involved for youth and adults! Camden County 4-H provides opportunities through clubs, project records, school enrichment, summer camps and workshops. Learn more below to find out what best fits your needs. Feel free to call (252-331-7630) or email (Ali_Huber@ncsu.edu) with any questions, comments or concerns. Camden County currently has several 4-H Clubs to choose from! Call the office (252-331-7630) or email (Ali_Huber@ncsu.edu) to join or get more information. 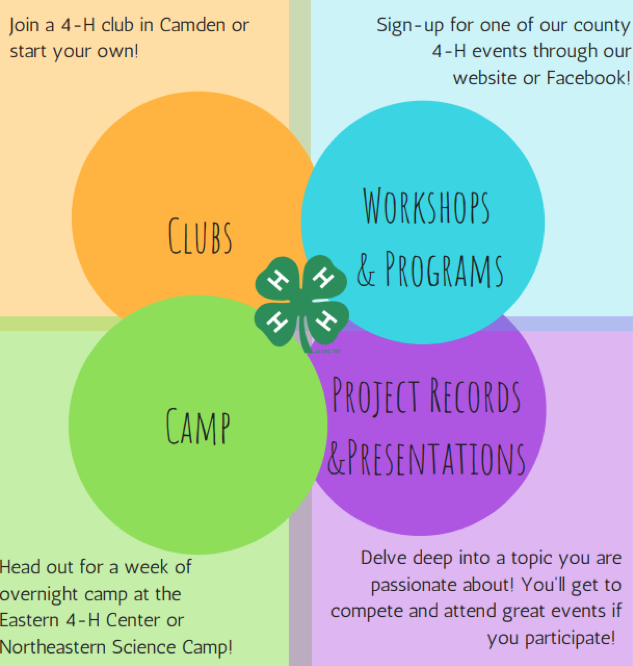 We welcome the opportunity for new clubs, check out the Camden 4-H Clubs page for information! Teen Court- an opportunity for high school age youth to learn about the court system in hands-on experience as they serve as attorneys, jurors, and other court positions. They also compete in mock trials. For more information on this program, check out the Camden JCPC page. Interested or passionate in a topic and want to explore it more? Project records might be a great fit for you. Project records can be done in conjunction with a club or event but can also be done independently and covers just about every topic you can imagine. You can design a project, be connected with research, materials and experts through your 4-H agent and have your project judged at the local, state and even national level for prizes. Give us call (252-3311-7630) or email (Ali_Huber@ncsu.edu) and we can get started! Another great opportunity within project records is raising and showing livestock in the Albemarle Area Livestock Show in April. Youth ages 5-19 can participate. Camden County 4-H is committed to working closely with Camden County Public Schools and home schools within the county to provide 4-H school enrichment through hands-on learning such as embryology and butterfly life cycles. If you are a teacher, school official, home school teacher or interested in knowing what school enrichment is happening in Camden County give us call (252-3311-7630) or email (Ali_Huber@ncsu.edu). Camden County 4-H could not exist without our wonderful team of volunteers! We are always looking for more caring and supportive adults to volunteer in our youth programs with clubs, workshops, planning, school enrichment and more. If you are interested give us call (252-3311-7630) or email (Ali_Huber@ncsu.edu) and we can find the right fit for you. Volunteers are required to register online and pass a background check. Registration is free and allows you to participate in all of these great experiences! Youth and volunteers register online. More information available on our registration guide and FAQ.